When it comes to love, nobody's perfect, but trying should count for something, right? 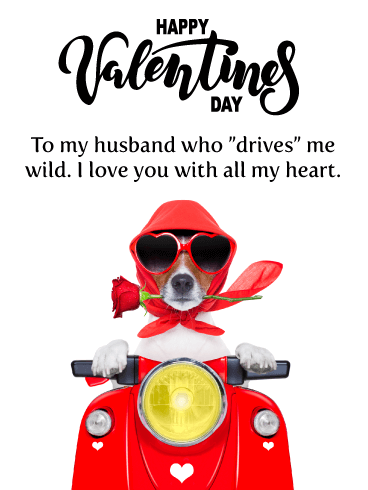 This funny Valentine's card will hopefully have your sweetheart laughing, knowing that even though you may not always get it right, she's the one who will always rock your world! Hey, at least I remembered the flowers. 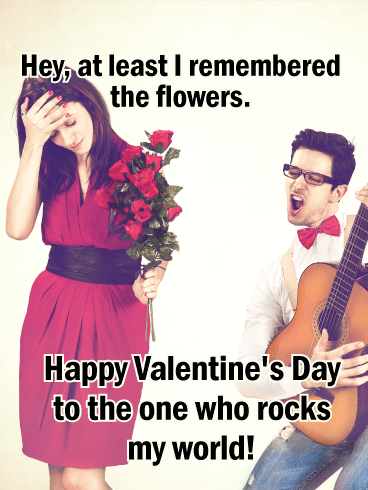 Happy Valentine's Day to the one who rocks my world! It's lovebird day again! Are your parents one of the sweetest couples you've ever met? Have they always been romantic and in love? Send your parents this gorgeous Valentine's Day greeting card with a thoughtful message. Love is meant to be celebrated and cherished. Take a moment to do both when you send this heartfelt Valentine's Day card to your parents. Sending Valentine's Day greeting cards to our sisters is probably more fun than anything else! They understand us, they understand love, they understand warm fuzzy messages and adorable cats, so basically-they deserve to get so many Valentine's Day cards their inbox overflows! Or, just send this one, perfect, and pretty Valentine's day greeting card to your sweet sis today. She's sure to love it (but not as much as she loves you). If we know how to love well, it is because our mothers first loved us! This fabulous Valentine's Day card is a thoughtful way to share the love with your mom today. 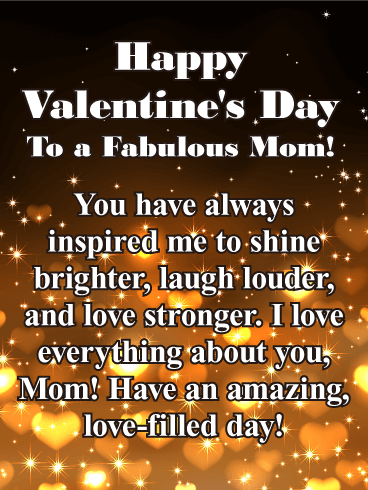 Wish your mom an amazing Valentine's Day and let her know she has always inspired you to live your best life. Love everything about your mom? 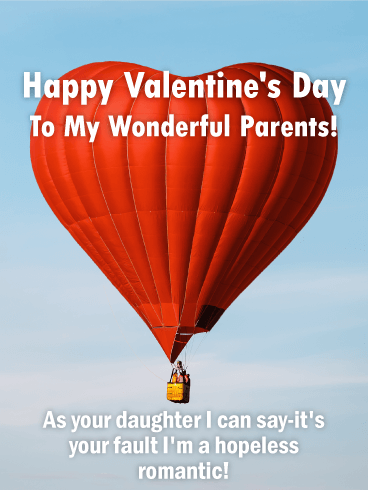 This is the perfect Valentine's Day greeting card for a mom from a devoted daughter! Do your parents make you believe in love? That's wonderful! 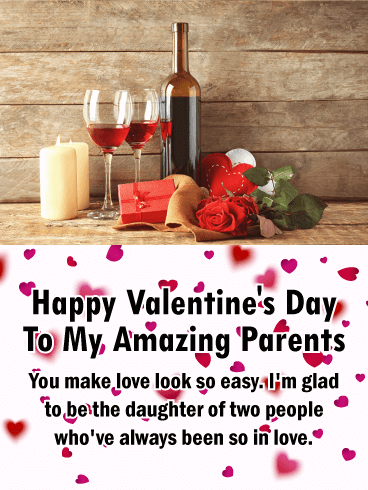 Wish your amazing parents a great Valentine's Day with this sweet Valentine's Day card that honors their love for each other. This romantic Valentine's Day greeting card has a playful message that will make your parents smile. If your parent's love lifts you up and inspires your own journey then this is the card for you. Dads love Valentine's Day too! Nothing is sweeter than receiving a Valentine's Day card from your loving daughter. 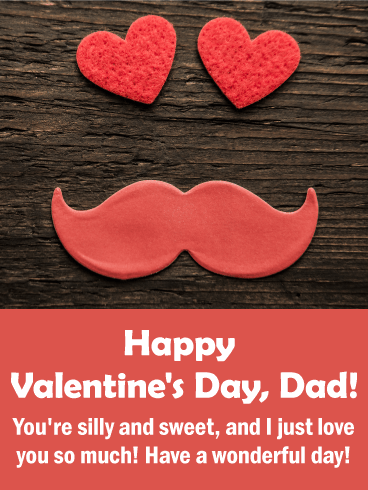 Share this fun Valentine's Day greeting card with your father today and take him by surprise! Dads never expect gifts and cards, but you can bet it warms their dear old hearts to hear from their kids! You can't get any sweeter or sillier than a Valentine's Day card with both hearts and a mustache! Your dad will love it. There's just something so endearing, so warm and cozy about a necktie! 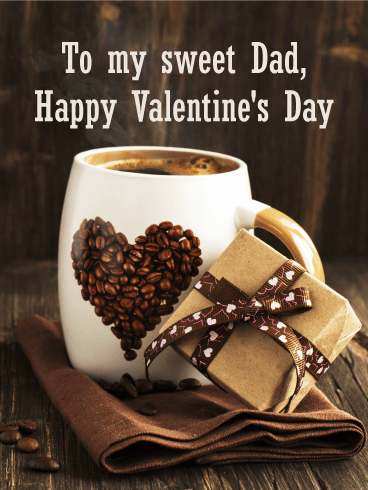 Send your dear dad this sweet Valentine's Day greeting card and make him smile. Wish your dad a Happy Valentine's Day with a surprise Valentine card! We can't forget our dads on Valentine's Day! They need love as much as anyone else, so be sure to send a special Valentine message to your dad today! Sisters make everything better. 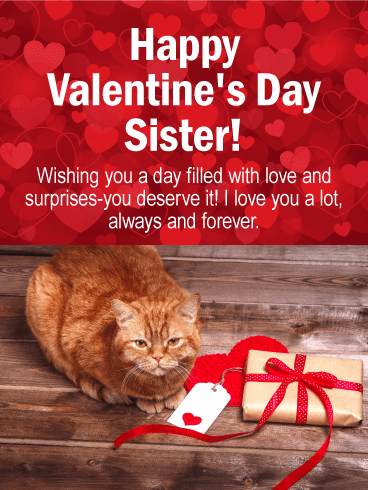 Wish your awesome sister a Happy Valentine's Day with this fun Valentine's Day card. Sisters are there to laugh with, cry with, be crazy with, and get into trouble with. At the end of the day, we love our sisters more than anything-even cupcakes. 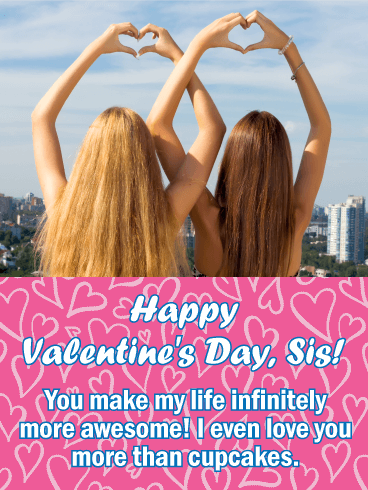 Send this hip Valentine's Day greeting card to your sis today and make it a great day. Moms are the best! 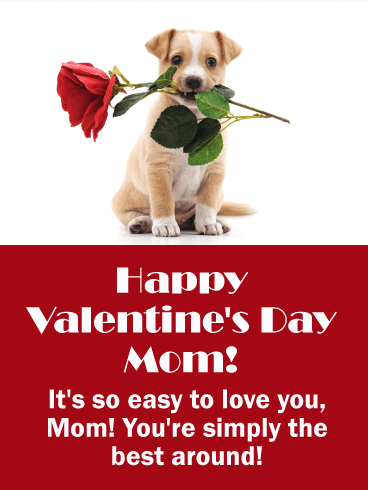 If your mom is just so easy to love, send her this adorable puppy Valentine's Day card and make her day. She's been there for you through thick and thin and always with a smile on her face and words of encouragement. Take a moment to send your mom this sweet Valentine's Day greeting card. 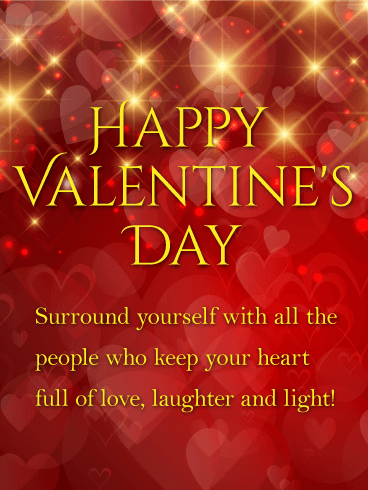 Charm your mom with your thoughtfulness and sweetness and send a delightful Valentine's Day greeting card that will really warm her heart. Nothing says love like a mug full of coffee. It can be hard to find the perfect Valentine's Day card for your father, but we've got you covered. The brown coloration adds a rustic element without being over the top, and the aesthetic is simply stunning. Bonus: Looking to make your dad's day extra special? Throw in a coffee shop gift card. This coffee is so delicious-looking that it's bound to make him crave some! Daughters and mothers share a special bond. What do you love best about your mom? Send a Valentine's Day greeting card to your mom and tell her how much you need her. 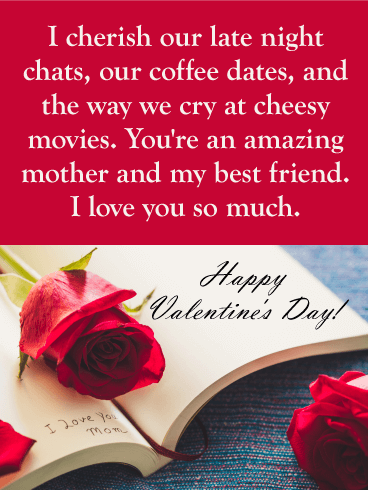 This Valentine's Day card honors the beautiful relationship you have with your mom. She's more than your mother, she's your friend. 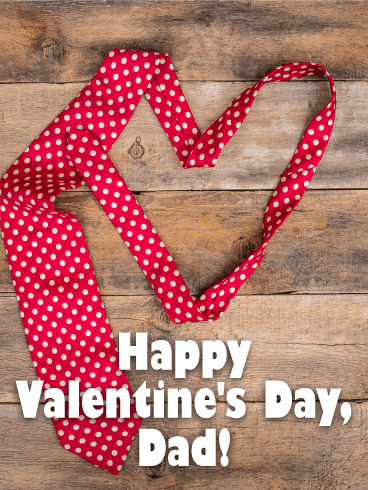 A quick, loving Valentine's Day card with a warm message is a great way to celebrate the day.